On June 8, 2009 we were scheduled to meet our third baby girl. We were very excited and so were big sisters, Gabrielle, 2, and Kyleigh, 14 months. Saige was delivered by repeat C-section, and at birth I knew there was a problem. I had been a NICU nurse for 7 years at that time. She did not cry, and when I glanced over I saw them resuscitating her. They said she had thick meconium fluid and breathed it in. Her heart rate would not maintain unless they were breathing for her. She was placed on a breathing tube and transported to Akron Children’s. She extubated within 24 hours, but remained on Vapotherm. After a few days, she remained limp, pale, and rarely even opened her eyes. They became concerned and mentioned Prader-Willi Syndrome. I had never heard or seen of this, even with my experience in NICU. They began ruling many things out…heart, muscle, errors in metabolism, brain and all was negative. The last thing we waited for were genetic tests to come back. At 2.5 weeks old it came back, she did have Prader Willi Syndrome. It is a deletion of part of the paternal 15th chromosome. She will remain hypotonic, and sleepy for approximately a year, then soon after it will be a complete turn and she will be starving. Always! She came home at 6 weeks with oxygen, monitor, ng tube, and many appointments. When she was 2 1/2 the hunger began to set in for Saige. They always remain hungry, but also have a very low metabolism. Calories have to be restricted and exercise is a must. We have locks on the fridge and pantry. Prader Willi has many other issues as well. She is delayed developmentally (walked at 2 1/2), has severe speech apraxia, and continues to have low muscle tone. 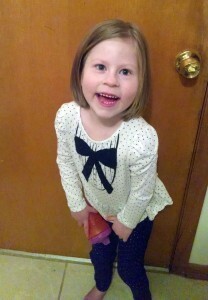 She will be 5 this June and will be attending her 3rd year in preschool. She is a happy, fun girl. One thing I remember Dr Protein telling me, as I sat at her bedside sobbing, was, “She will still be running and playing with other kids. She can have a happy life.” And it is very true. We have had 2 more children since Saige, and our locks have just became a “normal” in this house. Sure, we sometimes forget to lock something and she steals and sneaks. But we live day to day, and we survive. What a precious little boy . . .